Parks planers are lifetime tools, and re habbing one might be considered fun. If you look over at OWWM you can see a lot of pics of nicely restored ones that still work as well as the day they were made. I had a Parks planer in my shipyard for years. They are beasts. With the cast iron base and five horsepower (3 phase) motor it weighed in at around 1800 lbs. You could stuff a 16’ 4×12 in it and walk away. I can’t comment on the “fine finish” qualities but if you want to process rough timber into clean dimensioned stock, ( which is what planers are for) you won’t be beating a Parks very easily. I would highly recommend them if you have the space and power. Have a 12” from the 40’s and it would do my long leaf pine heartwood just like any other wood, when my new Dewalt would start shaking and then finally stalled….. The old Parks will also do highly curly maple without tear out, blades are sharp but several years old with hundreds of board ft through it…. I had a 12” Parks for a year or so and it did a fine job. 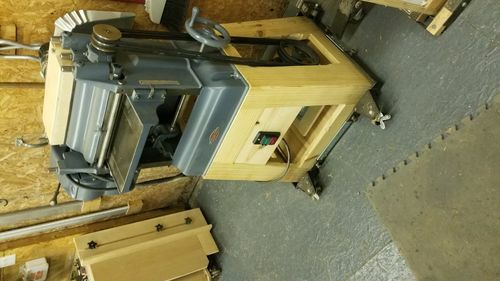 I sold it only because I was able to get a 15” planer with a Byrd head and I needed the extra width and wanted the benefits of a helical head. 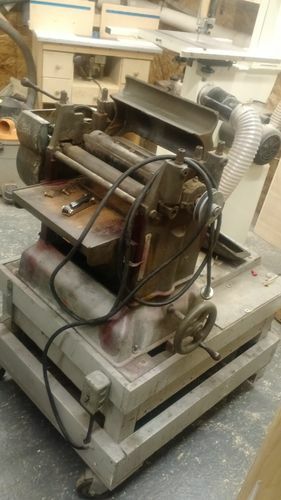 I have recently bought a craftsman/ parks planer and have started the journey of refurbishing it to like new state.. to be honest not much really wrong with it but very greasy and dirty from years of not cleaning and paint is worn off. I am going to invest a little money in all the bushings and other general maintenance products. From everything I can tell this machine truly should still be made today and sold. It is fantastic that you can get 97%of all the parts for the machine still from DC Morrison in Covington KY which is within driving distance for me! I will try to keep posted and anyone looking into buying one I would say jump all over it. I’m late to this party. BUY IT!!! BUY IT NOW!!! I have a Craftsman badged model and it is almost unstoppable. Yes, I wish it was a 15” and not a 12”, but it will take whatever I can throw at it. On lunchbox planers, I can take about a 32nd or may, just may be a 16th. This thing will take off an eighth without blinking. The only reason more isn’t take is the owner. It’s a great tool once tuned up. When you do the re-hab pick a nice color to paint it. Nice restored pink planer! Obviously a woman picked the color. Looks like a Mary Kay rep picked the Parks planer over a Cadillac. This is my finished product of my parks craftsman planer . I am really happy with everything but it doesn’t do as good as my benchtop planer.